In spite of the previous night’s unpromising weather forecast we arose early on Sunday morning to check the weather one more time….and Rick found it good enough to go. TRWs were still forecast for Palm Beach, but late enough in the day that we knew we could avoid those with an early take off; and the TRW prognosis for our West End arrival point had moved back in the forecast timeline enough that we thought we could beat those with a 1700 or earlier arrival. The sea conditions also looked to be good enough – just 2 to 4 feet predicted with reasonable intervals, and mostly with winds from the WSW, so we didn’t expect the Gulf Stream to get very sloppy. After finishing up our preflight checklist we started engines, tossed off lines, and were underway by 0800. The initial ICW leg – less than 45 minutes of inside cruising to reach the Lake Worth Inlet – was smooth under mostly sunny skies and light westerly winds. As Ghost Rider exited the inlet and aimed east we still had very benign conditions – a barely perceptible wind chop on top of gentle two foot swells. It was about as good as it gets for a daylight crossing, and the fly bridge was the perfect place to be on such a nice morning. By the time we were in the Stream an hour later, Dan had two trolling rods rigged with Rattle-Jet lures and we got the fishing lines wet. However, as it turned out there were no fish in these waters today. Juli, Chelle, Dan and Rick rotated informal shifts at the helm, although we mostly ran with the autopilot in “Track” (nav computer) mode for the bulk of the crossing. The AP did a commendable job compensating for the Gulf Stream current, crabbing from 12 to 15 degrees to starboard the first half of the route and keeping cross track error to a minimum. Over the last two hours the current seemed to let up as heading and course converged. Late in the day we could also see a small line of TRWs forming ahead of us near Grand Bahama Island. A long range look at the radar revealed some small cells in the 36-to-48 NM range, and the XM weather display indicated they were moving mostly east, away from us. That fortunately turned out to be true, and by the time we were within visual range of West End Settlement the storms had dissipated and the seas were nearly flat. The entry channel to Old Bahama Bay Marina is fairly straightforward – at least in the daylight; it’s definitely lacking sufficient night clues, especially where the channel takes two short 90 degree turns between the rock jetties. We had no difficulty maneuvering Ghost Rider once inside the marina’s basin finding plenty of depth, a wide slip and a helpful dock hand. Rick got everyone checked in at the customs office allowing us to take down the yellow Q flag and hoist the flag of the Bahamas, then after Dan and Rick hosed down the boat we settled in for the evening. A line of TRWs moved in shortly thereafter keeping us inside Ghost Rider, but the forecast for the next day looked good. As for “boat business” Ghost Rider ran well all day, with no stabilizer leaks observed; however, we still had some minor drips from the leading edge of the main engine’s oil pan. Rick torqued those just slightly. Dan & Juli on Ghost Rider's Boat Deck at Old Bahama Bay, West End. 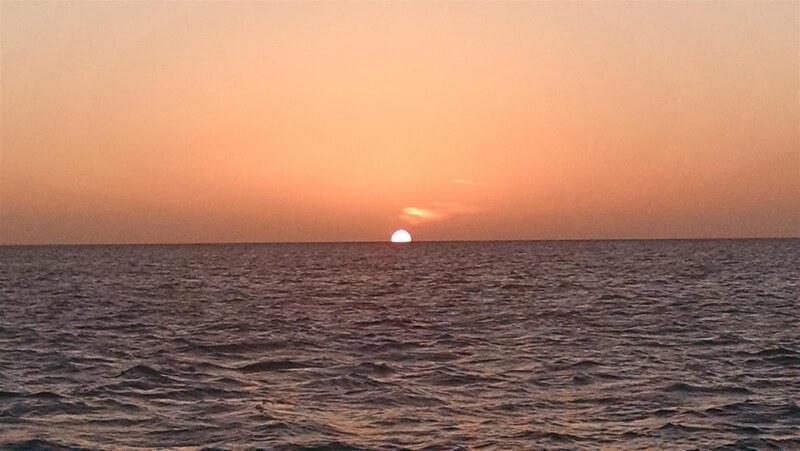 The next morning brought excellent weather….light breezes and sunny skies, with temps in the mid-80’s. After a few boat chores and rigging some light tackle fishing gear (thanks Dan!) 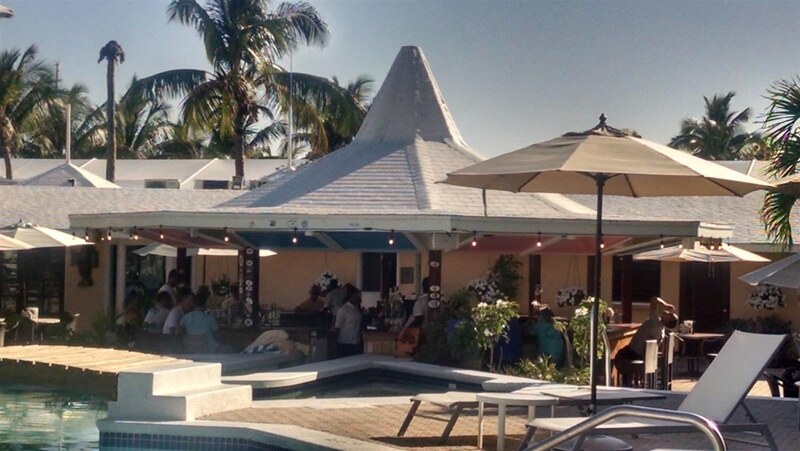 everyone got the chance to enjoy the charms of the Old Bahama Bay Marina. 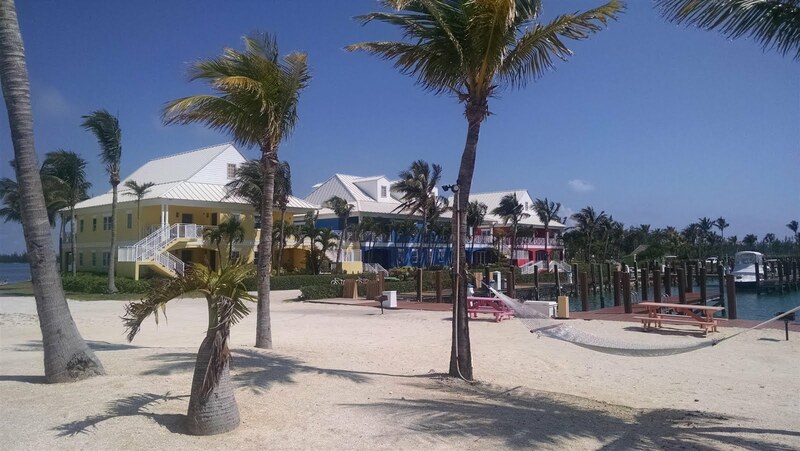 It’s a well-kept facility with colorful lodges, large swimming pool and a pristine beach on the island’s east side. It’s worth spending a day there. 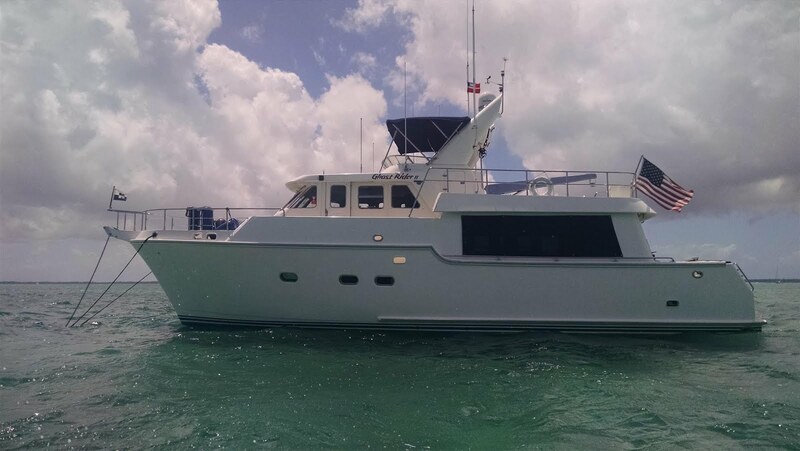 For those so inclined, there are also reputable fishing charters and eco-tour boats based there. 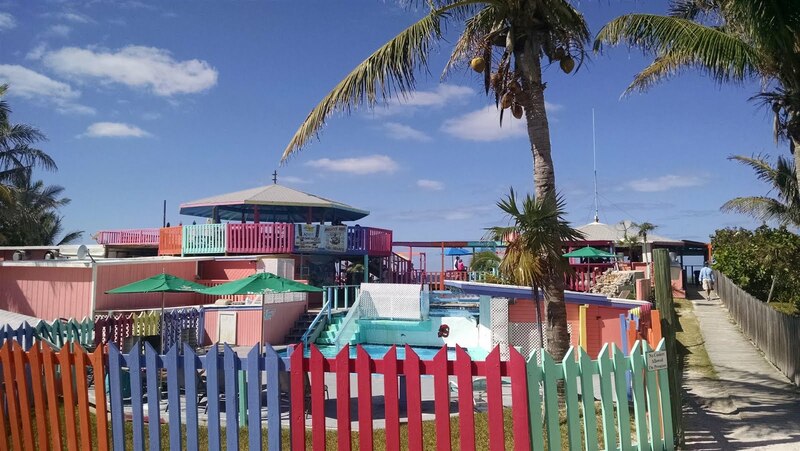 The "West End" of the Grand Bahama island was originally settled in back in 500AD by the Lucayan natives, but even still by 1836 had a population under 200. It was the Cival War in the States that really built it, as the Union embargo on the Confederacy created fantastic smuggling opportunities just 55 miles from the coast. Today the population of Grand Bahama is around 14,000, with Freeport as its main center of tourism, and the West End a mecca for fishing. 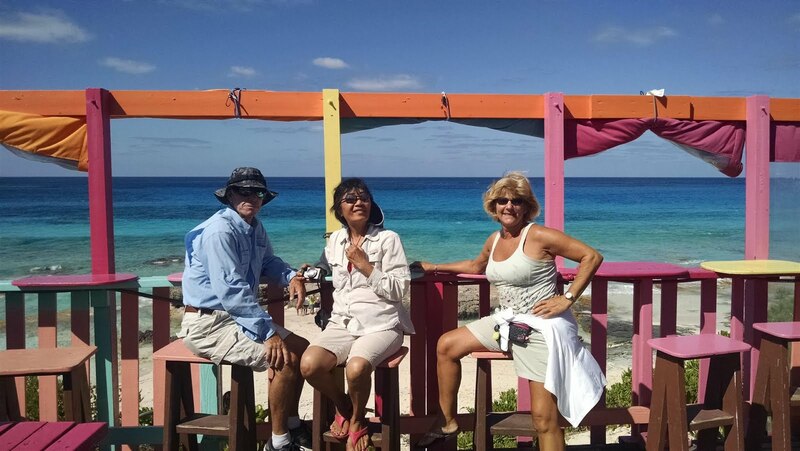 It's a good entry point for exploring the Bahamas, the Abacos in particular. While the longer term forecast wasn’t great, our departure weather was perfect and we were underway by 0900. Initially we ran north for about two hours to reach the cut to the east near Memory Rock. Up to that point the open waters of the Atlantic Ocean were fairly smooth with a mild two foot swell on the beam from the west and a light wind chop on top. 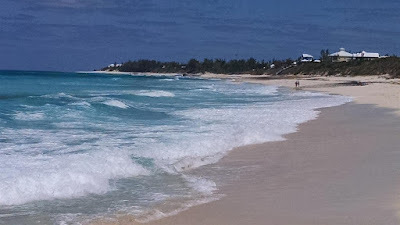 After making the turn to the east and into the shallower waters of Little Bahama Bay the sea state settled in at about 1.5 feet quartering on the stern. It was a fine ride with helm duties rotated among the four of us on the fly bridge. 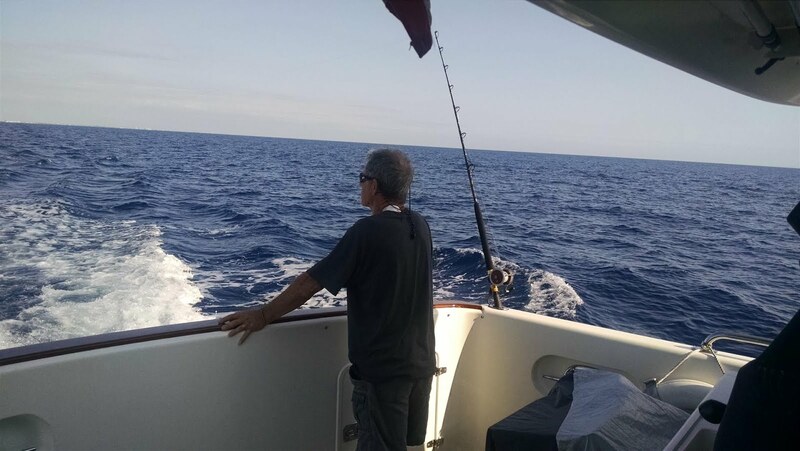 Dan had a couple of trolling rods deployed and it wasn’t long after our easterly turn that the starboard side line went off. Chelle slowed the boat so Dan could fight the fish on better terms. By the time Dan got it to the boat we had about one third of a barracuda on the cockpit deck – apparently there was a bigger fish out there that was pretty hungry. As the afternoon progressed we caught several more cudas (whole ones) – not good to eat, but they made pretty good cut bait. As we neared our destination – an anchorage at Great Sale Key – our local conditions were still quite benign but we could see on our Sirius/XM weather display that nasty weather was behind us and moving our way. Likewise, additional storm cells started forming nearby and were moving towards us…the skies quickly turned from clear and sunny to grey and threatening. We entered the southern anchorage area of Great Sale just after 1700, sighting five other boats already anchored there. We maneuvered among them and found a good place to drop in about nine feet of water, setting the hook in a sandy bottom at 1730. And we set it hard, using 1300 RPM in reverse before we declared the anchor fully set, and using plenty of scope (all chain) given the deteriorating weather. Within 30 minutes a line of storms moved in over us from the west with initial gusts at 40 knots, followed by sustained winds of 30-35 knots for the next two hours. We had white caps and 3 foot rollers in the bay. In spite of the hobby-horsing our anchor set was solid and did not budge. During that time several other boats scurried into the bay seeking shelter, and by sunset we had nine boats in the anchorage. Given the lousy weather we kept the boat closed up and ran the generator to provide everyone with air conditioned quarters. A few hours later the storms had passed and winds died down a bit, and thankfully we enjoyed relatively calm conditions overnight, with just a light swell and winds under 15 knots. The next morning our anchor watch software told us the anchor was still solidly planted and hadn’t dragged at all. The winds started to pick up again and we could see more storm cells in the area, although fortunately they bypassed us this time. We spent some time looking at the (Sirius/XM) weather forecast (for the most part there is no cell signal and no Internet access here.) The prognosis had improved from the night before, but it still wasn’t great. Based on wind strength and direction changes over the next day or so – westerly but clocking around to the north and east – along with the projected afternoon storms, we decided to stay planted for the day. While the anchorage was still a bit bouncy (not a good day for launching the dinghy), we still had a leisurely day to tend to some boat chores and do some fishing. After the early morning storm cells had passed by us we shut down the genset and opened up the boat. Rick and Dan tended to some basic preventative tasks concerning various sea strainers and pumps, and also ran some house battery tests with varying loads, while Chelle and Juli tended to some light cleaning and more meal preparations. Around mid-morning Dan put out a spinning reel with some of the barracuda cut bait, and it didn’t take long to get a hit. Fortunately this time it wasn’t another cuda, but instead was a small (about four foot) black tip shark. We had all heard those were good eating, so we kept it, filleted it and grilled it for lunch. We highly recommend it. The Blacktip Shark We Boated....and Ate -- Delicious! Later that afternoon we got the opportunity to briefly chat with another Nordhavn, as N57 White Raven pulled into the anchorage just after 1500. 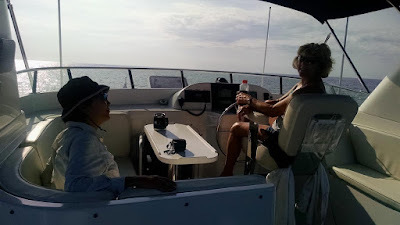 We chatted on VHF with Pat and Steve Strand for a while to catch up on each other’s cruising plans. They were making their final stop in the Bahamas after six weeks of cruising here and were headed to Charleston, SC for their next stop. Late in the day Rick powered up and tuned the SSB radio to the NWS offshore weather frequency and listened to the latest forecast, while doing the same thing via the Furuno’s XM/Sirius satellite weather feed. It was generally acceptable for the next few days, although winds would be steady at 15-20 knots out of the northeast. That made our planned stop at Allans Cay the next day a reasonable one as its orientation would provide protection for those predicted winds. Since the planned sortie for the day was a relatively short one – less than five hours – we had a leisurely morning while the generator purred along to recharge the house batteries after a full night of inverting had brought them down to around 84%. At 1000 we completed our preflight checklists, cranked the engines, retrieved the anchor, and set off for our next island hop. The day’s weather was as predicted with the temps in the mid-70’s, and humidity at 63% under partly cloudy skies. The breezy conditions gave us a short 2-3 foot chop, which Ghost Rider handled with aplomb. We let the generator run for another hour to complete its bulk charge cycle, bringing the batts to 97%, then shut it down to let the alternators take over from there. Our route this day initially took us north to loop around Great Sale Cay, then ESE to run along Little Bahama Bank. The winds increased to around 20 knots on the nose as the day went on, giving us 3 foot rollers at about 2 second intervals; that resulted in plenty of sea spray over the bow but Ghost Rider punched through it fairly smoothly. 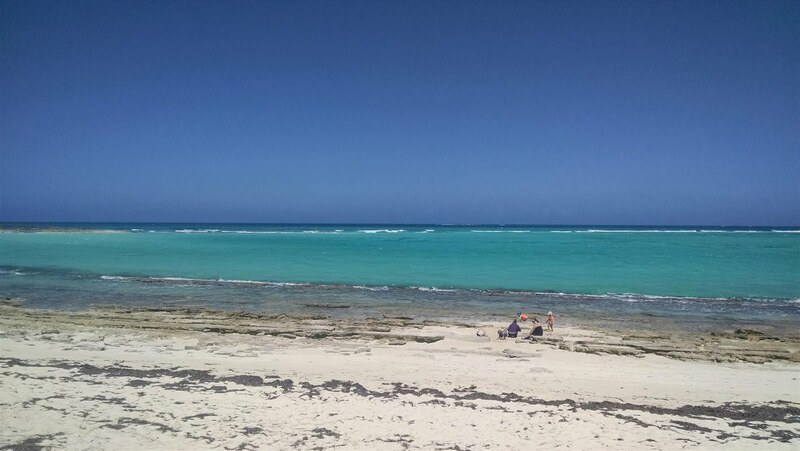 We arrived at Allans Cay around 1430 and coasted in as close as we could to the shoreline and while still staying in depth that gave us two feet under the keel; then we dropped the hook and set it with some extra rode given the winds. Dan on the Pole with a Nurse Shark on the Hook. We readied the dingy for launching but then the winds picked up a bit more…followed by the arrival of several sharks. 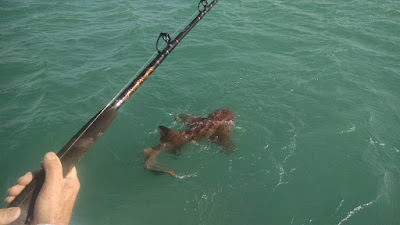 Dan actually hooked a “small” (about a five footer) nurse shark on one of our spinning rods. So we decided to wait on getting off the boat for now. Perhaps the better-sheltered anchorage at Green Turtle Cay the following day would provide more favorable conditions for that exercise. 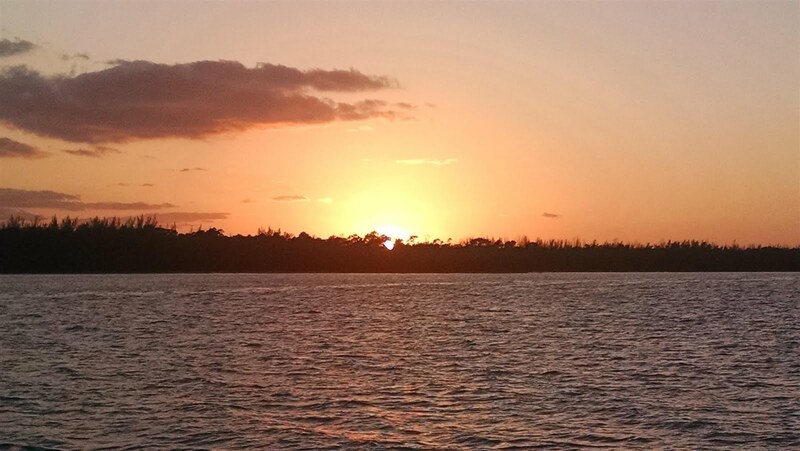 We enjoyed a gorgeous sunset under utterly clear skies, followed by a delicious dinner of black tip shark fillets, and called it a night. 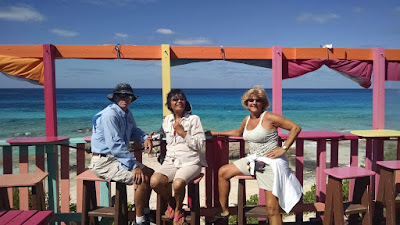 The sortie to Green Turtle Cay was even shorter than the previous day’s trip so we slept in the next morning and enjoyed another leisurely morning hanging on the hook. The winds were still cranking at 15 to 20 knots from the northeast, but we were secure with a good anchor set and adequate protection from the island. 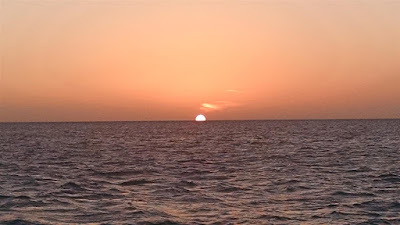 Around 1045 we yanked the hook up and set off on a southeasterly heading through the Sea of Abaco. 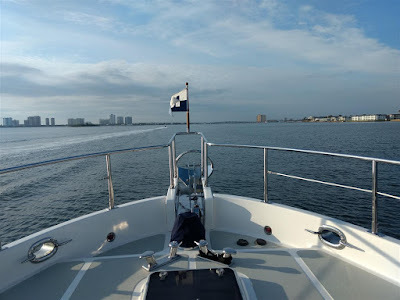 We encountered short seas to 3 feet and some scattered though very light rain showers, and once again it was a comfy ride; but it wasn’t a fly bridge day. 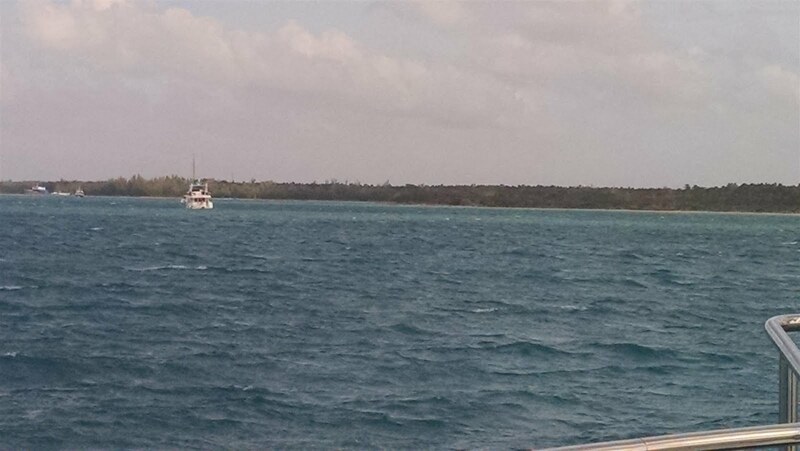 Ghost Rider at Anchor with Snubber Deployed at Green Turtle Cay. 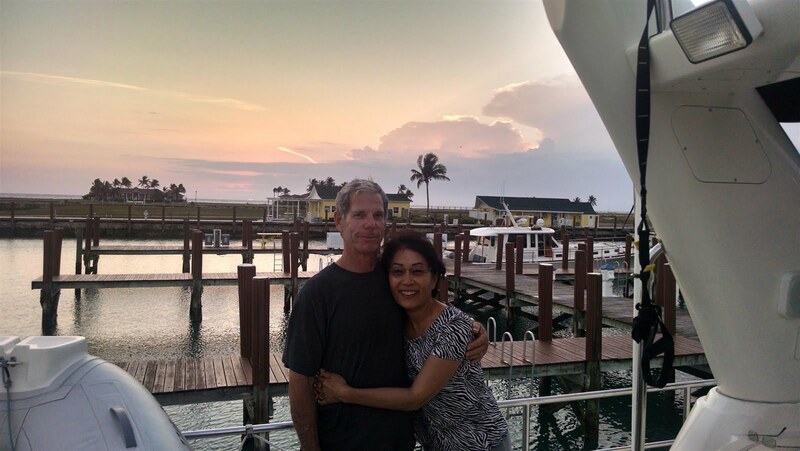 Around 1400 we neared the planned anchorage on the west side of Green Turtle near the small town of New Plymouth, and Rick noticed an AIS transmission from another Nordhavn anchored there – N57 Worknot, owned by Gale and Mary Plummer. We hailed them on the VHF and got a good preview report of the depth and spacing available, taking a lot of guesswork out of the ensuing anchoring maneuvers. 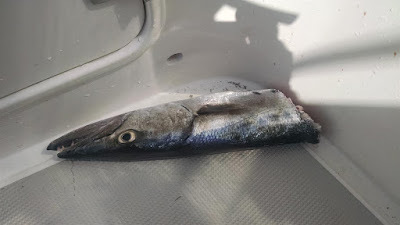 It was fairly shallow with 2 feet under the keel since we were arriving at low tide, but that was good enough and we found a nice patch of sand to drop the hook. We got a good anchor set on the first try once again, only a short distance from Worknot. Shortly after we got the arrival / shutdown checklist completed, and hosed at least some of the salt off the boat, Gale arrived in his tender to welcome us to the area. We had a relaxing chat on the fly bridge, and got an update on their travels along with some good guidance on attractions on the island, swapping some Nordhavn war stories along the way. Late that afternoon we finally launched the dinghy and the four of us piled in to first tour Black Sound bay, and then went back out and around the corner and into the Settlement Creek harbor at the town of New Plymouth. We found the dinghy dock there, tied off the tender, and took a brief walk through part of the town. 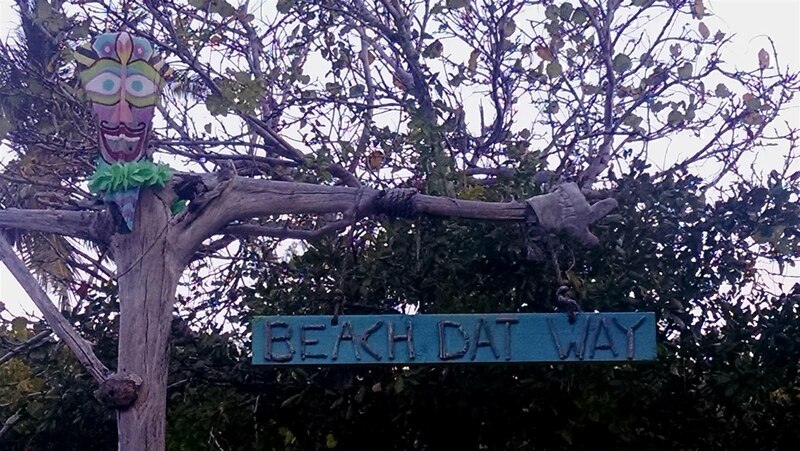 It’s a classically small, quaint and quiet Bahamian settlement, which will warrant more touring time. 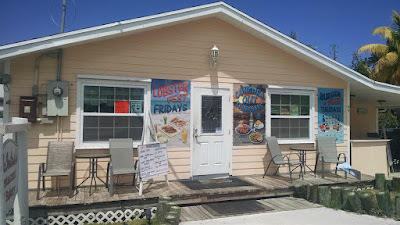 There are several interesting eateries there, and we stopped for an early supper at Harvey’s Island Grill where the cracked conch and lobster was superb. Once back on the boat we fired up the generator for a few hours to run the water maker, get some laundry done, and top off the charge on the house batteries. Then we shut down, opened the windows and enjoyed a peaceful night at anchor. We took care of some minor boat chores on Saturday morning while waiting for a few showers to pass, and then in the early afternoon dinghied into New Plymouth once again to try out another restaurant for lunch. This time we ended up at McIntosh’s where the cranked conch and cracked lobster plates were too tempting to pass up; and it fully met our expectations. After that we rented a golf cart and toured the entire island. The Atlantic side beaches and waters here are stunningly beautiful. 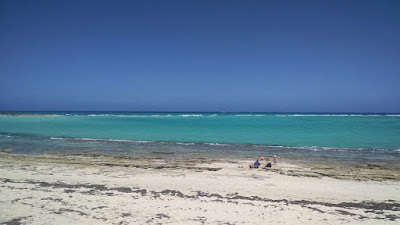 There are many strips of smooth white sand bordering ocean waters whose colors cover an amazingly wide spectrum of awesome blue and turquoise shades. Eventually we ended up at the far north end of the island where we found yet another gorgeous beach with plenty of sand dollars, as well as a coral covered northern-most point where one could simultaneously view both the open waters of the Atlantic on one side and the more protected Sea of Abaco on the other. On our return leg we took a spin around the well-protected northern bay called White Sound where we found a large mooring field and marina facilities in considerably better shape than what we saw in the south bay in Black Sound. 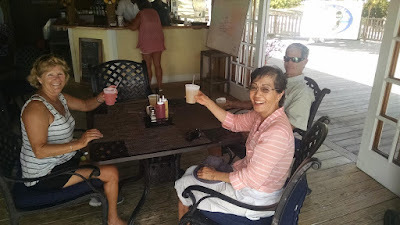 In that same area we stopped at the Bluff House Beach bar and enjoyed the two-for-one happy hour while overlooking the pristine waters of the sea on the west side of the island. The Goombay Smash is a specialty there and not to be missed….it’s a mixture of several rums with flavorful fruit juices making for a wonderfully relaxing tropical drink. Two of them will definitely get you attuned to “island time”. Eventually we made our way back south, dinghied on back to Ghost Rider, and then enjoyed another peaceful dinner and overnight while hanging on the hook. As we studied the weather forecast the next morning it became pretty clear that we would not want to spend another night in our current anchorage. A nasty cold front and associated storm system was headed our way from the northeast and would be in our area late Sunday night and Monday morning, clocking the winds around to the west and northwest. Not a good wind direction for this anchorage. 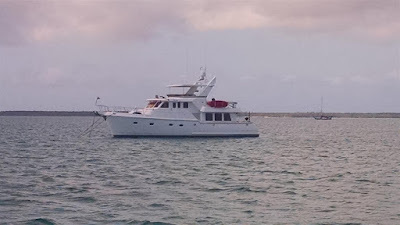 Our escape plan was pull the anchor and motor the short distance across the channel to the eastern shore of Great Abaco. This Sign Says It All, Don't Ya Think? 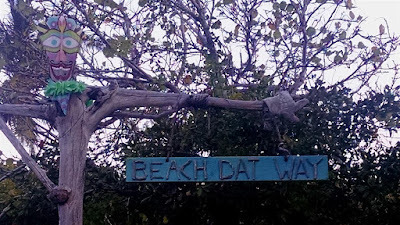 But that still gave us some time to take the golf cart back to the beach for some shell collecting and also grab another (conch!) 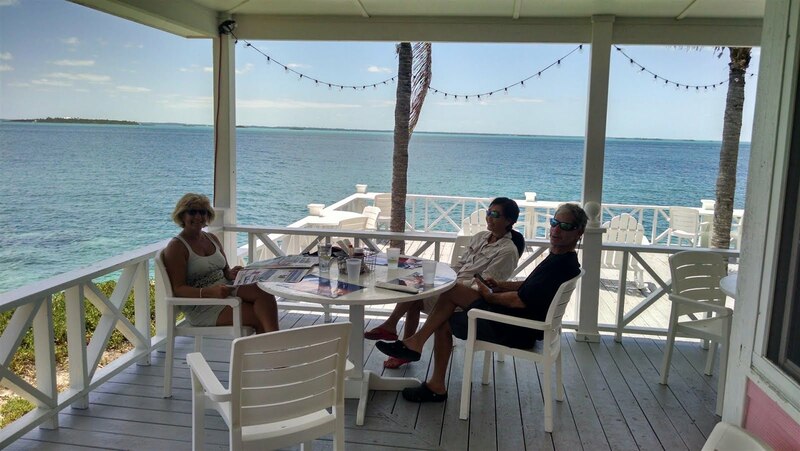 lunch at Harvey’s Island Grill. Gale and Mary joined us, and the guys talked about boats while the ladies talked about everything else. 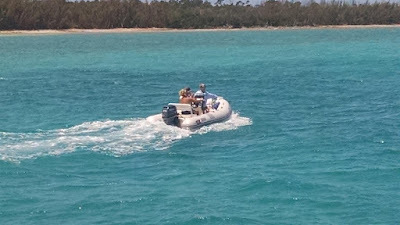 We returned to the boats around 1400, hoisted and stowed the tender on the boat dock, then made the short sortie over to Great Abaco’s shoreline. Winds were still cranking, now out of the south from 20 to 25 knots, but we found good holding about 450 yards from the shoreline and 550 yards north of Worknot’s new location. We found depths much better than what the charts told us to expect, with 7 feet under the keel at low tide. While we still had 1-2 foot rollers making Ghost Rider bob around a bit in the stiff wind, we had put out extra chain rode and backed down hard on the anchor in anticipation of the coming squall line. The anchor set was solid. The cold front and associated squall lines moved in during the wee hours of the morning and showers continued intermittently until late morning. The winds clocked around to the northwest a little earlier than predicted, but overall we were in a good place. Rick had lowered the taller antennae just in case of lightning, but we never saw any nor did we hear thunder. 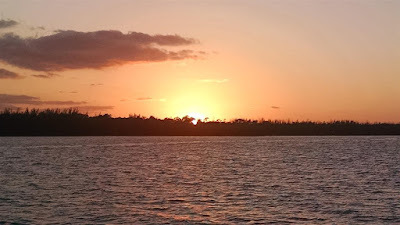 Our next planned leg would take us further south to Great Guana Cay, and while that was yet another fairly short run of 17 miles, it involved crossing what is known as Whale Cay Channel. That particular stretch of shallows has a deserved reputation for being wickedly rough and occasionally even dangerous – one guide book says that in certain conditions (called a “rage”) it can be suicidal to attempt to cross due to the way large waves coming from the open Atlantic interact with the shallows and rocks in the narrow strait. Given the recent frontal passage and stiff winds, we decided to give that patch of water another day to calm down a bit. 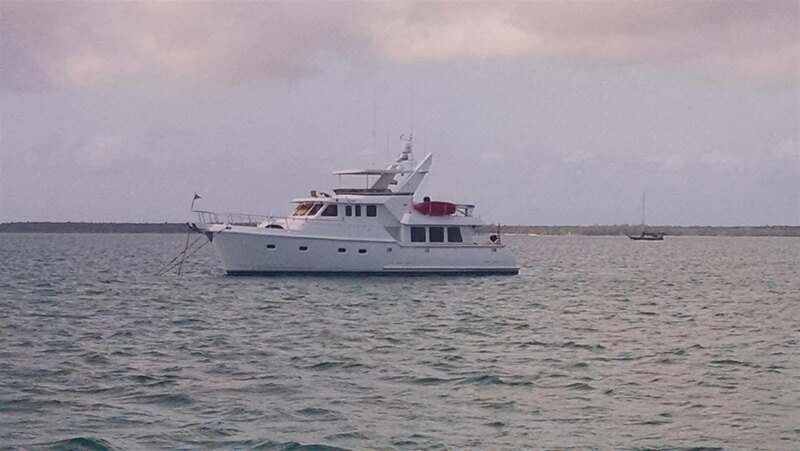 So we had a lazy day just hanging on the hook off the shoreline of Great Abaco Island. By early afternoon skies had cleared, and air temperatures reach into the upper 70’s with 15-20 knot winds from the northwest. We launched the tender again, and Chelle, Juli and Dan dinghied to the shore to stroll the narrow strip of beach and collect some shells. Meanwhile Rick took care of a few boat shores, updated the work-in-progress blog diary, and also enjoyed some quiet time for a little reading. (Current book: “The Grey Seas Under” by Farley Mowat.) He also tended to the engine room and lazarette preflights in anticipation of the next day’s departure. We had another peaceful evening on board Ghost Rider and got a good night’s sleep. The next morning brought mostly clear skies and the expected brisk breeze from the north that followed the frontal passage. We retrieved the anchor and were underway by 0900 heading SSE towards the Whale Cay Channel. The VHF radio reports of conditions in “The Whale” were good though, and turned out to be accurate – a bit sloppy at times with three foot swells at short intervals with white caps on top, but nothing near what the locals call “rage” conditions. 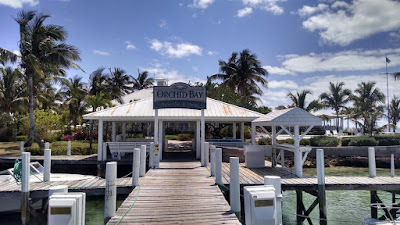 We plowed our way through it without issue and approached Orchid Bay Marina on Great Guana Cay just before noon. The marina is protected from the Sea of Abaco by a substantial man-made rock breakwater, so it was calm water and wide fairways, but there was some confusion over slip assignment, which resulted in us having to dock Ghost Rider twice; the first time bow-in resulting in the realization that the finger pier wasn’t long enough for us to disembark the boat; the second time stern-in which provided marginally better de-boarding logistics. It all proceeded without drama, and besides, Rick needed the docking practice after so many days of anchoring. 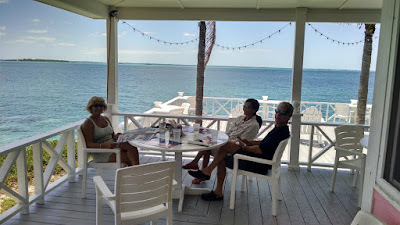 After we got the boat all tucked away, we had a relaxing lunch at the marina’s Sunsetter restaurant, which also provided us marvelous views of the Abacos inside waterway from its sea-side dining deck. Then we rented a golf cart and went on a tour of the island. Like Green Turtle Cay, Great Guana Cay is mostly a golf cart community that is a bit more commercialized, but that’s a very relative scale in the Bahamas…only 150 people live here along its 7 mile strip of land between the Atlantic Ocean and Sea of Abaco. 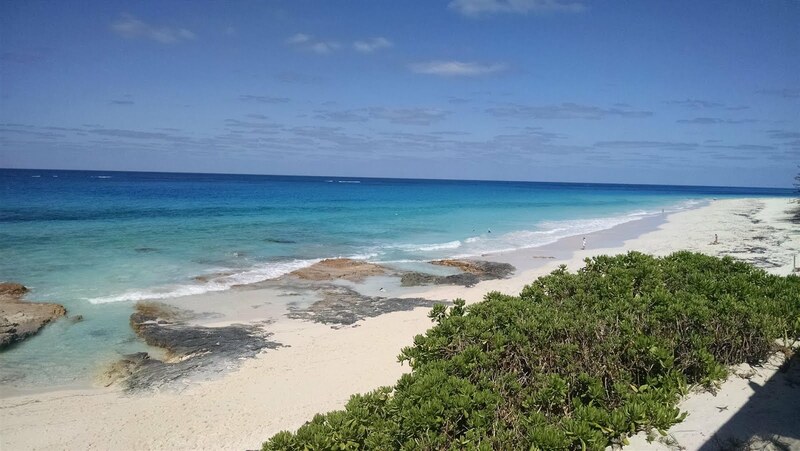 The eastern side features elevated bluffs that overlook the open ocean, providing commanding views of its beaches, reefs and crystal clear Bahamian waters, with their typically stunning green-blue colors. 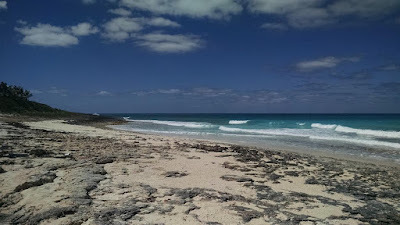 We drove from one end of the island to the other, exploring side roads and sandy paths and shelling along the beaches. On the return drive we stopped at Nippers Beach Bar & Grill which is perches on the southeastern bluff overlooking the Atlantic. Famous for its “Nipper Juice” (yep, another multi-rum and fruit juice drink, and we yes downed some), it’s definitely a party place with its open air seating, swimming pool and boisterous Caribbean music. After returning to the boat to get cleaned up and catch up on emails, we relaunched the golf cart for the short run to Kidd’s Cove Bar and Grill for dinner. The food is excellent – whether conch, grouper or mahi – once it finally gets served; you need to be on island time, and the Goombay rum cocktails help with building that patience. 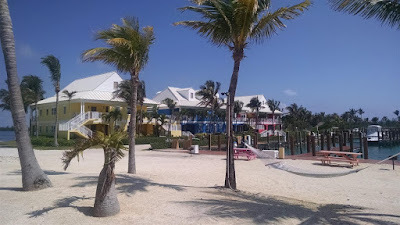 We awoke to our very first calm and sunny morning in the Bahamas early on Wednesday. Ghost Rider’s bow was facing the breakwater at the edge of the marina basin and just beyond it the Sea of Abaco was completely flat. Yay. Finally...a Perfectly Flat Sea Just After Daybreak....Yay! 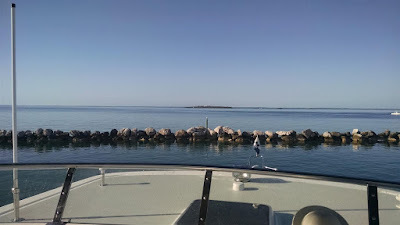 Figuring this would be another short sortie day – just a couple of hours across the channel and a bit further south to the Marsh Harbor area – we had a relaxing breakfast, caught up on email and the news, and checked out of the marina. Around 1030 we cranked engines and departed. The cruise down to Abaco Beach Marina at Boat Harbor, which is on the east side of the Marsh Harbor peninsula, was perfectly smooth under clear skies and temps in the upper 70’s. Perfect…until we arrived at the marina, as they seemed totally unprepared for our arrival in spite of the reservation we had made early this morning. After about 20 minutes we finally got a slip assignment, and as Rick approached the designated slot, the marina called on the VHF radio and announced they had assigned the wrong one…and were still working to find another. Rick backed Ghost Rider out of the narrow fairway and back into the wider entry fairway; but after another 10 or 15 minutes of station-keeping (and still no slip assignment) he decided to exit the marina basin entirely into open water to make the wait a bit less stressful; marinas can be tight quarters when you have nowhere to go. Fortunately the near calm conditions made for fairly easy maneuvering. After another 30 minutes the marina finally called us back on the VHF to assign a different slip, so back in we went and docked Ghost Rider stern in. We figured that would be the end of the day’s drama, but….nope. The power quality at this marina is somewhere between bad and terrible; showing only 215 volts on what was supposed to be 240 volt power pedestals made the ship’s inverter/charger very unhappy….and after a short spell we had to start the generator to power the boat. Continuing the less than stellar experience, the water pressure at the dock was almost nonexistent, so we decided to s-l-o-w-l-y top off the boat’s water tanks instead, and later use the boat’s own pump pressure to wash off some salt. As it turned out there was a large fishing tournament about to start, and the marina was inundated with large sportfishing vessels; whose crews proved once again they are the best at being obnoxious and rude. 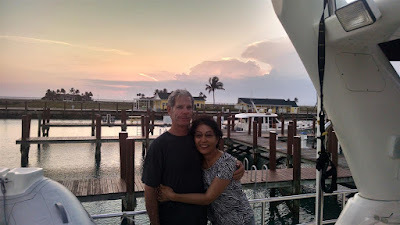 The marina itself is quite well constructed and visually appealing, with a nice pool area and poolside bar, so we enjoyed some brief time ashore; but we’ll be cutting our stay here short and seeking another place to spend the next night or so. Paying marina and water fees plus having to run the generator is just plain nuts. Our rough plan is to head back east across the channel and check out the mooring field near Hopetown on Elbow Cay if we can get there on a high tide. Glad you are having a great trip. Making me hungry. Great post. We are back in Milwaukee and it is snowing. Take care.